Peaches have to be my most favorite fruit. I love a fresh juicy peach. I love taking that first bite and having that juice run down your arm. I love peach ice cream, peach tea, peach popsicles, peach schnapps, peachitinis……..anything peach! Unfortunately, here at my local grocery stores, the peaches have been crappy. You can take a big ol bite and you sure won’t have any juice running down your arm! Big sigh. So, I went to a fruit stand not too far from me. Darn it all….it happens to be down the street from a casino. Dam. Should’ve just stuck with the peaches. But that’s another story. 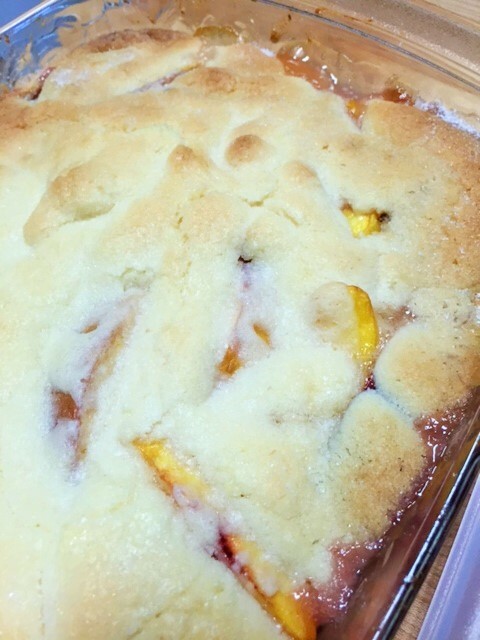 I was quite pleased with the peaches I got, and knew I just had to make a cobbler. Now, I am not a huge fan of cooked fruit. But for some reason, I was craving peach cobbler. 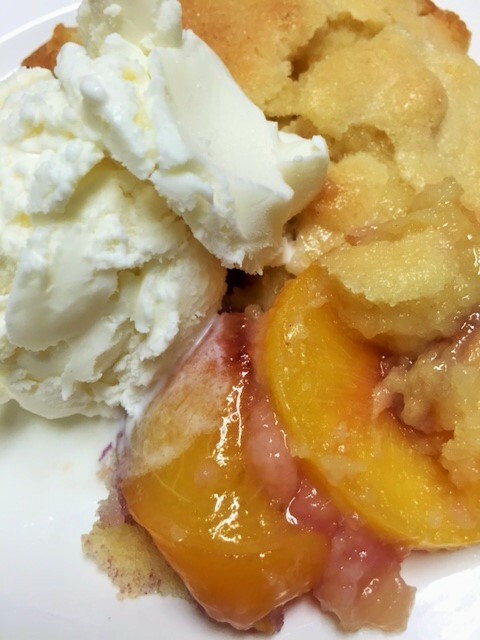 This recipe works great with canned or frozen peaches too, if you can’t find good fresh peaches. The crust is what makes this cobbler special. It’s not that mushy, soft doughy stuff. This has a sugary crunch. It’s like a magic crust. You will love, love, love. 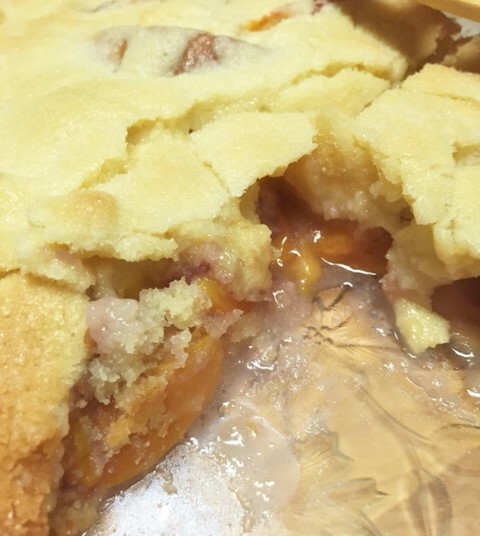 I have a friend who loves peach cobbler. Hi Miguel. I used to make it for him using a different recipe. I can’t wait for him to try this one. Miguel, I have it all packed up for you. 3 cups of sliced peaches (I used 4 medium size fresh peaches) I leave the skins on. 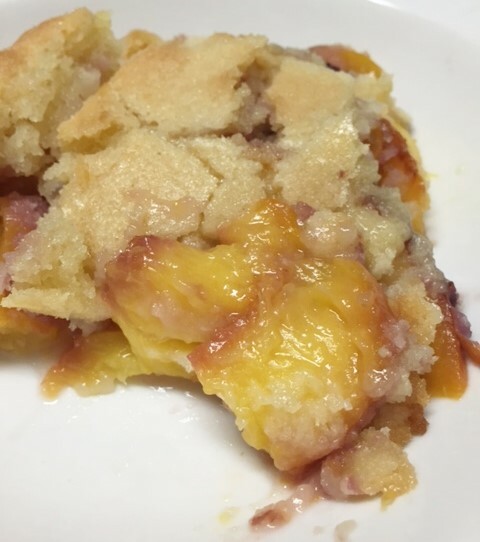 Put the peach slices in a square baking dish (9×9). Scatter bits of the 2 tblsp. of butter on top of the peaches and sprinkle with the sugar. Set aside. With a mixer, mix together the butter and sugar till creamy. Gently mix in the flour. Don’t over mix. Add the egg and mix just until smooth. Drop by little spoonfuls all over the peaches. Sprinkle with about 1 tblsp. of sugar. Bake for 35-40 minutes or until top is golden. Allow to sit out for 15 minutes. Serve warm with vanilla ice cream. I’m telling you…..the Crust is incredible.